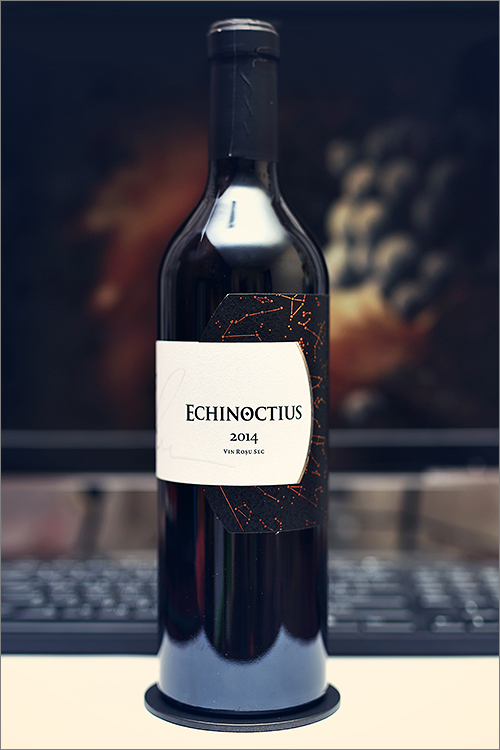 Today we are going to review a wine blend made of cabernet sauvignon, rara neagra and merlot grape varieties – a wine that has raised to legendary status over the years – Echinoctius 2014 from Equinox. This is the flagship wine of Equinox line, it has been aged for 24 months in new french oak barrels and is produced in a very limited edition of only 1630 bottles, thus the wine is a rarity even here in Moldova. This wine is nothing less than a bottled symphony, where rara neagra is playing the role of a violin in an orchestra, adding those mesmerizing velvety-rustic notes, merlot is the viola, bringing on those smooth and supple accents to the body, while cabernet sauvignon is the cello – the backbone of the whole orchestra – that one element that builds the structure and the main body of the final blend. But enough theory, let’s get straight to the tasting! Noble and deep garnet color, with scarlet hues towards the rim of the glass. The nose is strong, filled mostly with black fruits and jam: ripe sour cherry, blackcurrant, blackberry, black cherry, black mulberry, black plum and black raspberry. An instant later the nose is filled with notes of cherry tree wood, nutmeg, roasted oakwood, dried figs, dates, tobacco, red and black pepper and some nuanced hints of hazelnut. The wine is dry, with high alcohol level, high acidity and ripe tannin. It feels bold, extracted and tannic, with a nuanced fruity accent. This is a quite expressive, ripe and complex wine, as it tastes firm, tart and seedy. The wine is quite well balanced and has a nice harmony between fruit and barrique. It has a long finish and an balanced, seedy-tart, yet velvety aftertaste. This is definitely a great Wine of Moldova and the overall rating says the same, with 91.8 points scored it is right there, among the best wines we’ve tasted so far. Please click on the chart icon on the left in order to get to the wine rating page, where you can find all the wines we’ve tasted to date. Conclusion: this is a wine that is yet too young to drink now, as its acidity and tannins has to be settle down a bit – a wine that has yet to reach its top form in the next 3 to 5 years. Despite its youthfulness, it has plenty of tannic grip on the palate, with a textured character to the mouthfeel and a touch of alcoholic warmth showing through, with some mouth-watering acidity and a lovely texture, that make this a wonderful food wine. We would recommend to pair this wine with meaty and spicy dishes rich in umami flavour and smooth textures, like for example tournedos rossini beef medallions with foie gras and truffles or some grilled pepper steak, so that all the angularity in the wine will be perfectly counter-balanced by the creaminess or spiciness of the dish. Enjoy!